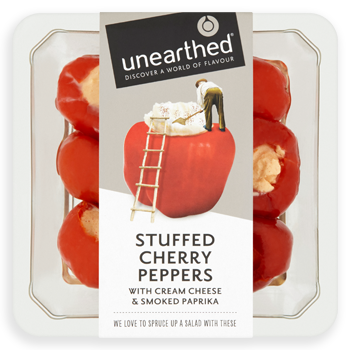 The perfect bite-sized appetiser - these stuffed peppers have a slight kick, beautifully complemented by creamy cheese and smoky paprika stuffing. We think they’re great for sprucing up a charcuterie board too! Cherry Peppers (45%) (Cherry Peppers, Water, Sugar, Spirit Vinegar, Antioxidants: Citric Acid, Ascorbic Acid; Salt, Firming Agent: Calcium Chloride); Cream Cheese Filling (42%) (Cream Cheese [Skimmed Cow’s Milk, Buttermilk, Cream (Cows’ Milk), Salt, Milk Proteins, Dried Buttermilk], Sugar, Sweet Smoked Paprika (0.6%), Gelling Agents: Carrageenan, Xanthan Gum; Salt, Acidity Regulator: Citric Acid; White Pepper, Preservative: Potassium Sorbate); Sunflower Oil, Oak Smoked Sunflower Oil.